Mobile applications are commanding more attention on smartphones than the web, highlighting the need for strong app stores on handset platforms. For the first time since Flurry, a mobile analytics firm, has been reporting engagement time of apps and web on smartphones, software is used on average for 81 minutes per day vs 74 minutes of web use. 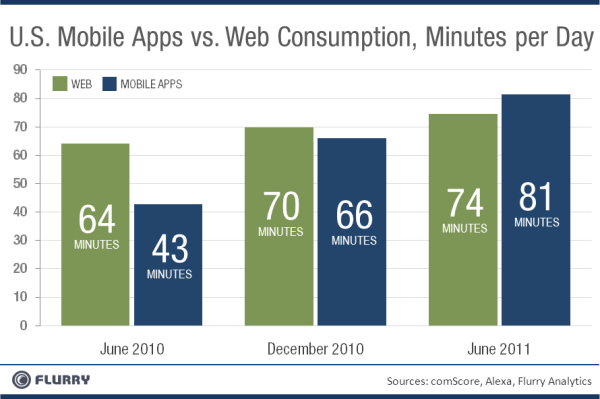 Just a year ago, mobile web use outnumbered time spent on apps with 64 minutes as compared to 43 minutes. Trends are ever subject to change, but this one indicates that we’ll be waiting longer for HTML 5 web apps to unify the world of mobile devices. What are our mobile app minutes spent doing? Flurry, which monitors software on iOS (s aapl), Android (s goog), BlackBerry (s rimm), Windows Phone (s msft) and J2ME platforms (s orcl), says we’re a growing community of gamers, with 47 percent of our app time spent playing. Social networking followed up with 32 percent, while news, entertainment and other activities each accounted for single digits. The entertainment figure of only 7 percent seems low to me given that mobile video, a time-intensive activity, is popular: Some data suggests that iPad users watch 2.5 times more video than traditional web users, for example. While YouTube has a solid mobile web interface, many platforms kick users into a native YouTube application. Last July, YouTube said it was serving 100 million videos per day through both its mobile software and website. Regardless of that potential anomaly, the data underscores a few points I’ve made about mobile app ecosystems: If a platform doesn’t have a strong set of third-party apps available, consumer adoption of the platform becomes a greater challenge. To some degree, we’re now seeing that with Google Android Honeycomb tablets as well as RIM’s BlackBerry PlayBook. There are other issues facing each of these, but a lack of optimized apps isn’t helping any, especially with the move from web to apps on mobiles. [T]he fragmentation issue in mobile only gets worse with each year with new devices, different implementations and operating systems, the cost of rolling out an app across multiple devices around the world can increase exponentially. As such, the browser provides the prospect of being the great unifier so you can truly design once and run everywhere (where the browser is available). For the simple apps that are less interactive and require less multimedia capability, like the popular social networking and news/weather apps, browser provides the perfect avenue to maximize impact with least amount of development. Sharma’s thought made perfect sense to me back then, and while I’m still in general agreement with him, I’m beginning to wonder if the situation has changed. Instead of a mobile market with a number of platforms, we’re now witnessing the space become dominated by just two in Android and iOS. The third spot is up for grabs, although Windows Phone 7 has recently gained perceived momentum. BlackBerry / QNX and webOS (s hpq) are in transition, while Symbian (s nok) is on the way out. All the smartphone platforms are using WebKit browsers, so there’s still opportunity for web apps to unified across a large number of devices, but with such dominant operating systems in play, there may be less need for the web browser as a “great unifier” in mobile than there was just a year or two ago. And as long as apps keep appearing, the trend indicates consumers will keep buying. What a surprise. Instead of using the possibly unoptimized website from their smartphone, users prefer using the HTML5 apps instead. This should hardly come as a surprise as most “daily consumption” type websites (Facebook, newspapers, etc) provide their own HTML5 apps for mobile users. As the same observation hasn’t been made for desktop browsers, it seems that even smartphone users prefer to do their “deep” browsing on a proper computer instead. If it were just about HTML5, the productivity advantages would be clear. But in practice it often ends up being HTML5 plus a collection of non-standard libraries and frameworks. You may end up having to know more technologies to build apps in HTML5 than you would going native. 1. Lots of entertainment services are only available in US. I’d say most of them. So this will skew picture in favor of apps. 2. Flurry’s so called methodology is laughable. I find this stats little misrepresenting – we spend more time on mobile web because most sites aren’t yet written for web. Hence open the site zoom-in, trying to find the links we are searching for … we spend a whole lot of time there. So time isn’t the factor, not sure if theres a way to measure engagement, that, IMO, is way higher on apps than mobile web. I think the most important point that is missing is the ability to use HTML5 to do native calls to the device making it so the devices APIs become more standardized to the web. In previous articles the fragmentation of Android has been pointed out and I am not sure that Chrome does not become the OS of choice for Google powered mobile devices in the future. These findings are in line with a GSMA-sponsored study(http://bit.ly/kdUCun) conducted by Zokem in US and UK, released back in February. Zokem study had concluded that average app usage is 667 minutes a month versus web browsing of 422 minutes a month. Certain use cases, like gaming, video, and music are more prevalent on apps. News and search are done more on web browsers. You mentioned â€œThe entertainment figure of only 7 percent seems low to me given that mobile video, a time-intensive activity, is popularâ€. The GSMA/Zokem study had concluded that adult entertainment â€œreceives practically zero usage from native appsâ€ and mostly done through web browsers. So, that could explain the discrepancy that you are noticing. We had a heated discussion on Web versus Apps back at March CTIA, with content providers on app side and browser folks naturally on the web side. Here are some more thoughts (http://bit.ly/hbRhtu). 217M mobile handsets in the US. 53M of them are smartphones. That category is subdivided by OS version. Any App developed for a particular device/OS combination is going to limit their market to less than 10% of the total available users. As Scott McNealy said, many years ago, the network is the computer. Is “minutes” really a good measure of the success of a UI? @Flurry, suggest you spend your time making serious conclusions. HTML5 is still in its infancy. Things are developing rapidly however, and when the standards around local data storage and 3D graphics are resolved, there will be very little need for â€˜local appsâ€™. Operating systems are likely to evolve to make them more integrated with the interface so less like the â€˜bit on the sideâ€™ they are today. We will see more standards formed for the user interfaces of web applications themselves. Wireless connectivity and bandwidth will improve. It seems to me that Googleâ€™s Chromebooks will be fantasticâ€¦.once HTML5 is really in gear and developers are on board. Itâ€™s not like Google to get things wrong (but not unheard of! ), but it is like them to innovate and see the future. Microsoft clearly agree what with Windows 8 applications being based around HTML5 technologies, and Internet Explorer 10 being very much an application platform. Web applications are the future for mobile and desktop, it makes sense, but we are not there yet! I worked with both native and mobile web apps for more than three years now. What I can tell from my experience is that native apps are superior in so many ways to web apps, that it’s hard to understand where all this talking in favor of web apps comes from. I myself hardly use any web apps in a browser on my iPhone and iPad. Everything I do is within an App. When I say I do have experience, I mean it. We even built PhoneGap plugins in support for a mobile web app. What I can tell you is the total cost of the web app was about the same as it would have been building it natively. The only real benefit of building web apps is a sort of democratization: people not having the skills to build native apps can do it. After all, it’s relatively easier to get started with HTML/CSS and see immediate results than learning Objective C. However, if you get two seasoned developers, one iOS and one web, I don’t think you will see a significant difference in productivity. Actually, if you apply the same quality standards, the web developer will have a hard time delivering the same experience as the native one does. A second apparent benefit is portability, but this is a hard buy: the native UI experience is different enough between iPhone and Android alone, without talking about the rest of the platforms. If you build a business app with web technologies it will not look good on either of them. If you try to do anything other than business… well good luck with that. 1. Take back the Web. Just as the “walled gardens” tumbled 15 years ago (who remembers AOL? Excite? Magellan? CompuServ? GeoCities? etc. ), so too will we once again embrace HTML’s consistent universal access ethic, and rebel against the toll-taker chokepoints of device, carrier, app account, etc. 2. #FlurryFail. Hey, let’s compare apples to oranges and call it a victory for us apple growers! Hmmm, the original data analysis on which Flurry’s report is based even admits that apps via devices are mainly used for games and social media – nearly 80% of the time. It is no small surprise that Web browsing is mainly used for serious computing. I think a more accurate headline should be: “Apps for Games, Web for Biz”. As currently written, it’s deceptive. Makes it sounds as if HTML is a dinosaur, when nothing could be further from the truth. Oh, and let’s not leave off the notion that the Web can be characterized as a better server of actionable information. I’m not sure the same can be said for app based games and social channels. Now how much would you pay? Read on for deets at my FanFoundry blog. The story doesn’t cover the title. Why “sorry HTML5”? This isn’t suprising. HTML is made for content. Truly engaging,interactive applications need true native abilities. Less interactive applications don’t. There’s no one answer. HTML5 will remove the need for some applications to go native, but many (games are a great example) will continue to require native abilities. At Kony, we don’t force people to choose. We let you create great web apps including HTML5, and we let you create great native apps so you don’t have to gamble on the mobile marketplace. the Web is holistic moves surely but slowly in a manner equal across the platforms – thus, the different mobile platties will certainly make available new sensors, new machine features, graphics that browsers cannot catch. it’s like you look at your desktop today and there’s always some stuff you won’t leave to do in a browser. a mobile phone is really no different. What about apps like mine, that are written in html5 and then converted into native apps using things like phone gap? Wonder is that is a part of this survey, and I agree with previous posters html5 is still in its infancy, give out time. As a native app developer for both iPhone and Android, alot of my work is releasing version 2 of apps made with phone gap when the client and users find it so unresponsive as to be almost useless. A browser based html5 web app wrapped in a native app is a poor user experience because the native wrapper takes memory then the browser on top takes memory and then the app itself (being HTML) has no memory control to stop it slurping up the rest of the device memory. Also re: the survey.. why so little take up of mobile video… easy ;- look to the 3g networks, certainly in the UK the quantity of data, coverage (even in large cities) and consistency of speed mean video is almost unwatchable without huge amounts of caching. “All the smartphone platforms are using WebKit browsers” – Windows Phone is not. 1) The dominant platforms have emerged and they will probably play out as: iOS on the high end (of the cost for devices) with Android capturing almost all the rest. I don’t think Blackberry will be able to recover, and given MS history in the mobile area, IMHO Nokia just committed suicide (I hope not, I’ve been a huge Nokia fan and still have one of their phones, but not for long…). For now it may make sense to develop apps for those platforms if you can really do “extra” stuff within the app that isn’t possible or efficient in HTML (of any flavor). 2) Because there will always be competition for the space, and maintaining 2+ apps is costly, everything will move to some HTML standard and specific apps will give way to websites developed for mobile screen real estate rather than operating systems. @Sanat Gersapa: I think that’s a distinction without a difference. Windows Phone 7 doesn’t yet have sufficient market share to skew these numbers significantly and the new “Mango” version will have IE9 which has excellent HTML5 standards compliance. More generally, I think the truth is that HTML-based “shortcut on springboard” apps are distinctly inferior to native platform in state management so it is a big difference in experience for the user. Many business apps are built with HTML5 and the packaged as an app. Look at phonegap.com as an example of an open source tool to do that. A presentation I gave on HTML5-ish mobile frameworks including Sencha, jQuery Mobile, Titanium and Phonegap. Here’s a hint, almost all apps besides games are wrapped web apps. Linkbait it up! the link to the slides does not work anymore, did they move? Tal, Your is right on… HTML5 and libraries such as jquerymobile and sencha allow for the creation of powerful applications that can run in a browser. By encapsulating the web app in a lightweight container app you can increase security and insure that the user is using a web client that can handle what your are throwing at it. As things move forward and more browsers adopt html5 standards the wrapper app will become less important. Heck, the html 5 standard isn’t even finished yet and we are all in transition. Good observations from all here and interesting stats from the article. Roshan +1… This is eventually the road all business apps will go to mitigate their risk. Why build something for one smart phone platform when you can build it for all? With GUI frameworks like Sencha Touch or JQuery Mobile, combined with PhoneGap I can produce an app that essentially becomes native on any of the major platforms. I see that many of the apps are just a wrapper against an HTML browser component. Most of them do not store much data locally and require internet connection, so these are basically web apps. I agree with Tal. One of the big advantages of HTML 5 is that it provides a non-proprietary space for mobile apps and the technology has only recently been deployed. The first HTML 5 mobile have just come online. How can you compare established ecosystems with one that hasn’t even begun? HTML 5 is not yet in high gear. Give it time. I suspect that looking forward both iOS and Android will wrap HTML 5 with native containers better than today. HTML 5 is NOT necessarily a classic browser application. I have read many sites lately talking about the mix of both world. Having a core application written in HTML 5 and wrapped in a native container. That said I am a novice there and thus my comment may be a load of you know what. I hope it makes sense. Mobile web apps are needed because many web designers are not good at their craft. Also, it’s easy to have a visual icon which an app provides instead of having to open the browser and find a bookmark or enter a web page. When designers start to take many different form-factors and bandwidth constraints into consideration there will be less of a need for web apps. Mobile web sites need to be designed like apps, but getting business to buy into that is never even a possibility. Apps get people all a twitter and will be quiet long enough for a mobile experience designer to work effectively. The magic keeps people away! I have never seen a number that supports a full mobile website as a primary destination. But, you have to recognize that such sites are often found though tasks in progress or location, rather than as explicit finds. In terms of mobile web numbers, what is your experience of using YouTube on the iPhone? Half the time it doesnâ€™t work, or work well. That is the primary reason for such low numbers in my personal experience and opinion.